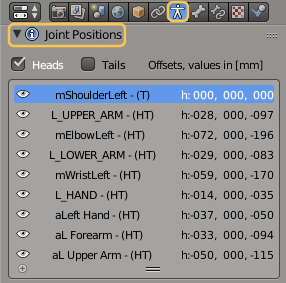 The Joint Positions list is a subsection of the Armature Data properties window. It contains all Joint overrides which are currently defined for the active Armature. for a fresh (not modified) Armature this section is empty. 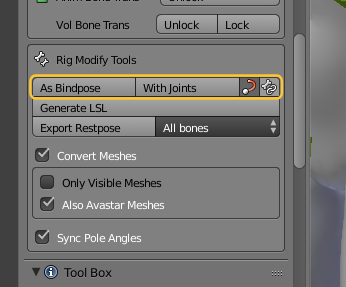 Lets further assume you have opened the Posing panel in the Toolshelf and located the Rig Modify tools. And finally you have decided to use the just created pose as the new restpose of your rig. You see that the mShoulderLeft Bone and all its child bones are listed here. 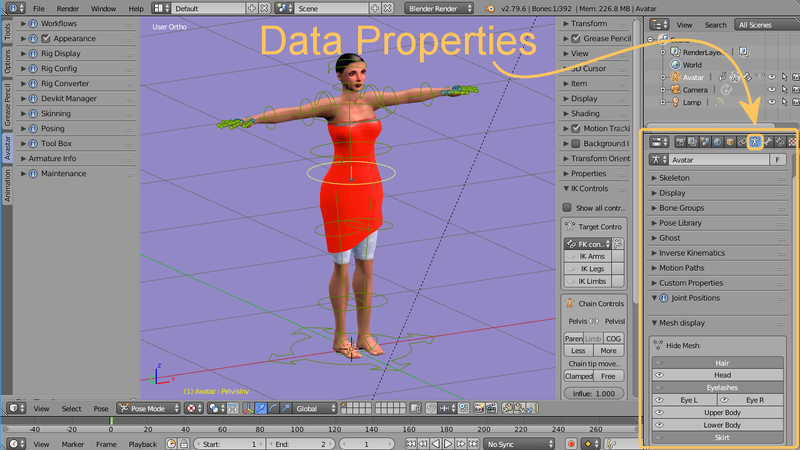 this includes the Collision volume bones and the attachment points. 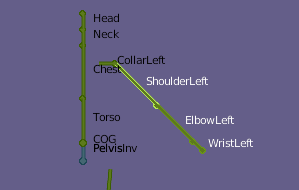 So by just rotating the shoulder bone you actually have created 9 joint overrides. 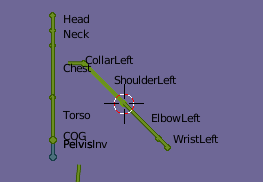 In the top row you define if you want to see the joint overrides for the bone heads or the bone tails or even both of them. Below the top row you find the Joint Overrides. 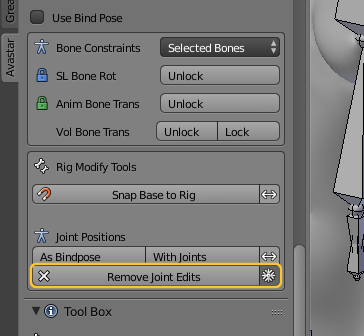 This is a normal Blender list widget where you can sort and search for specific bones. When you click on one of the eye icons, then the 3D Cursor will be placed on the head of the corresponding bone. So you can very quickly find a specific bone in the set. Tip: mShoulderLeft has only been rotated. Thus you see the head location offset is <0,0,0> in this case (see image further above). However if you enable the visibility of the Bone tail offsets, then you will see the mShoulderLeft bone tail has been relocated.